It’s pretty hard to go from avoiding foods with artificial flavors, preservatives, etc. to suddenly eating those foods at every single meal. Now that I’ve gotten used to eating real, home-cooked food on a regular basis, I can’t help thinking about the quality of the ingredients in the food I eat and wondering where those ingredients came from. Just last week I was away in Virginia and Pennsylvania for a week, and it reminded me of how different my diet is now from the way it used to be. I can’t believe some of the foods that I used to eat and enjoy! The waffles and muffins that always seemed to taste so good at hotel breakfasts now just seemed bland and spongy and unappetizing, and the “maple” syrup (that had no real maple in it whatsoever) was no comparison to my beloved 100% pure maple syrup. Even with all of the compromises I ended up making, I still managed to find some ways to eat healthy on vacation. It’s a bit of a challenge, but with a little bit of planning ahead it is possible to eat real food when you’re away from home. There are a lot of things you can buy or make ahead of time to bring with you when you go on vacation, especially if you know you’re going to have access to a mini fridge in the hotel where you’re staying. Whenever I know there will be a fridge, I pack fresh fruits like raspberries and blueberries; lettuce, green beans, cucumbers and other veggies; grass-fed cheese to go with homemade crackers; homemade jello or fruit snacks, etc. And I sometimes do some baking ahead of time too so I can bring some homemade sourdough bread or muffins with me for breakfasts or snacks. Here are some other ideas for healthy easy snacks to bring when traveling. If you’re staying at a place with a fridge, you can pick up quite a few real food snacks by finding a health food store in the area where you are staying. If you end up staying somewhere that has a kitchenette then you can really do a lot to prepare and cook foods that are similar to what you would have at home. Even if all you have is a fridge, though, you can still buy fresh organic fruits and vegetables, cheeses, etc. You might even be able to find a health food store that has a little cafe area where you can buy some pre-prepared meals. It won’t be quite the same as home cooking, but you might be able to find something that’s a little better quality and a little more “real” than the typical fast food and tourist food. 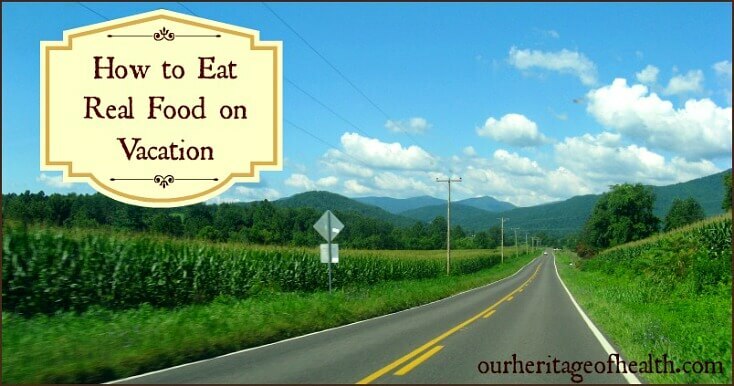 If you’re vacationing in a more rural area, you might stumble upon a farm stand or even a farmer’s market where you can buy fresh local produce and other specialty items like homemade breads or other baked goods. You might even be able to find some pastured eggs or grass-fed meats if you have access to a kitchenette to cook them in. On another trip near Niagara Falls on the Canadian side, I got some nectarines, plums, and green beans at a farm stand along the road, and it was really nice to have some fresh produce to go alone with all of the not-so-fresh tourist food I had eaten. 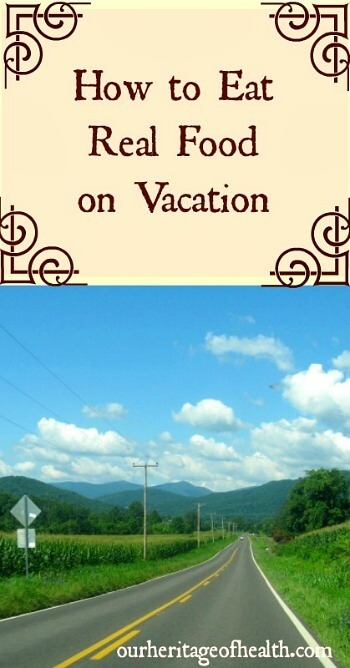 Vacation is one time when it’s definitely best to put the 80/20 rule into action. I wouldn’t be surprised if I just used up my whole 20 percent for the year on this one vacation, but I had a great time and I saw places that I never would have seen by just staying at home, so it was totally worth it to me to compromise on my usual food for a week. Unless you have a food allergy or intolerance, the best plan it just to try to relax and take the focus off of food for a week and focus on having a fun time instead. If you know that eating a certain food will make you feel sick then try to avoid that food as much as possible, of course, but otherwise, it’s best to just try not to stress about what you eat. If you spend your whole vacation worrying about food, then you’ll be too stressed out to enjoy anything else! When I was in the Lancaster area, I ate at one of the smorgasbords (because you can’t go through Lancaster and not eat at one), and for dessert I had a slice of Shoo-fly pie. Did the filling have GMO corn syrup in it? Probably. Was the crust made with Crisco? Most likely. But I decided to ignore all of that and just thoroughly enjoy each bite. And it was delicious! What are some of your tips for eating real on vacation? This post is shared with: Sunday School at Butter Believer, Party Wave Wednesday at Holistic Squid, Natural Living Link-Up at Jill’s Home Remedies, Frugal Days Sustainable Ways at Frugally Sustainable. Since eating real food we have not been on the road, but this is something I think about, thanks for the tips. Great tips! When we went on vacation to GA to visit family, my husband and I made sure that we had some homemade things to help us eat a little real food. We brought homemade granola bars, banana bread, and some fresh fruit. We also brought organic cereal with no bad ingredients, we buy the Mom’s Best brand which is pretty clean and not pricey. We also didn’t worry too much about eating bad things. We don’t get to see my extended family that much and didn’t want to ruin it by worrying about food. Great tips! We are going a mini road trip / vacation in a week and I’ve been planning our meals out, so you can see why I was happy to see your post. One of my plans is to make a big bbq pork roast in the crockpot and keep it in containers for the hotel room. We can heat it up real quick for BBQ sandwiches. I was looking for a few other make ahead meal options. One we did last year was bean and cheese burritos, so we might do that again.